If you purchased with us before, you can quickly re-issue a new policy. Click here to set up a password. Posted December 4, 2018 by Roxanna Brock McDade & filed under Destinations, Driving to Mexico. Mexico is a country that covers a vast amount of land area and has everything from pristine tropical beaches, to dense lush jungles, to ancient ruins and some of the best resorts in the world. Regardless of what you’re looking for or what time of year you plan to travel, there are exciting destinations throughout Mexico. 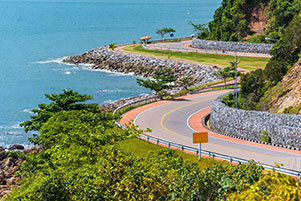 For road travelers the entire country is accessible by a highway system, if you know where to start. About 81 miles due south of Chula Vista, if you cross at the Tijuana border, Ensenada is a Pacific coast port city on the Baja California Peninsula with a heavy focus on culture and local wildlife. Visitors can seek out the Museo de Historio on the waterfront or enjoy shopping at popular stores along Av Adolfo López Mateos near the ports. Ensenada is also a popular point to see migrating gray whales. And it’s just an hour from the largest wine producing region of Mexico, Valle de Guadalupe. This is a great day trip from southern California to experience a taste of what Baja is all about. A travel destination popular with artists, featuring a number of impressive galleries, Todos Santos is about 970 miles south of the US border with Tijuana. Flanked by the Sierra de Laguna mountains, nearby beaches offer world class surfing. From hiking to hitting the waves, the options are endless. San Felipe, on the eastern coast of the Baja Peninsula, is only a short drive from several national and state parks such as the Alto Golfo Biosphere Reserve that protects the habitats of shorebirds and harbor porpoises. Parque Nacional Sierra de San Pedro Mártir, at an elevation over 10,000 feet, is home to Mexico’s second largest astronomical telescope. San Felipe is a sleepy town where you can enjoy the gulf of California, and may even spot a rare California condor. A popular destination, and during the winter months, the temperatures are usually mild and San Felipe is located on 125 miles from Mexicali. 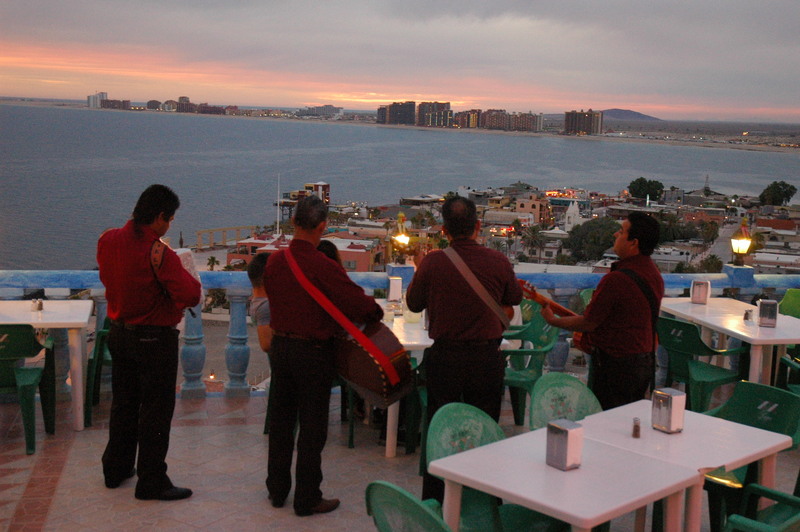 Known as Rocky Point, the resort town of Puerto Peñasco is a both a fishing village and a first class tourist destination. It’s also known as Arizona’s beach because it is only 62 miles southwest of Lukeville, Arizona. Famous for dune backed beaches that front the Sea of Cortez. Enjoy fresh shrimp, beach strolls and the tidal pools of Bahía la Choya’s (Cholla Bay) in this quaint Mexican town. The capital city of Mexico, the high altitude grandeur of Mexico City needs to be seen to be appreciated. At 7,382 feet, it is even higher than Denver. The valley sits between two volcanoes reaching up to 16,000 feet including the massive snow capped Popocatepetl, which is still quite active. Major attractions include the ancient temple of Teotihuacan just northwest of the city, Baroque cathedrals and original art by Diego Rivera. The city has many deep rooted traditions including the Dia de los Muertos and the pre-Christmas Las Posadas activities. The city is 700 miles south of Laredo, Texas through Monterrey. About 976 miles south of Laredo, Texas, Oaxaca is a destination for history fans that will take you through Monterrey and Mexico City, as well. Colonial buildings made from green volcanic stone are a huge draw. There are colorful murals and the area is very popular for it’s mole, a delicious sauce with a hint of chocolate. Due to the isolated nature of the city, the native mestizo culture has been preserved. The original inhabitants of Oaxaca are artisans and you can purchase their goods, as well as watch them being made. Travelers to Oaxaca often come in search of fine handmade items such as leather work, pottery and jewelry. Nestled in the central highlands, San Miguel De Allende was named the best city in the world by Travel + Leisure. It is well known for it’s thriving arts community, a vibrant local culture and colorful traditions. The neo-Gothic church Parroquia de San Miguel Arcángel features looming pink towers that draw visitors worldwide. Located 549 miles south of the Laredo, Texas crossing, a trip to San Miguel will take you straight through the heart of Mexico. 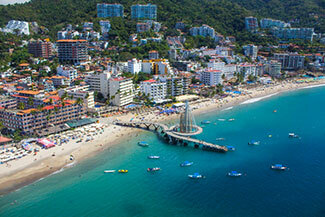 A popular resort town on the Pacific coast, Puerto Vallarta is known for its pristine beaches and abundant nightlife. The scenic seaside promenade (or malecon) sits alongside an active cobblestone downtown area, where you can find lots of shopping, art and fabulous food. Puerto Vallarta has plenty to see and do. Located 1,060 miles south of El Paso, you will see much of the country along the way. It’s well worth the driving distance. Guaymas is located 325 miles to the south of Tucson, Arizona, in the southwestern side of the state of Sonora. Sitting on the eastern side of the Sea of Cortez, the city is nestled in a valley. A wide variety of seafood comes in daily, including the giant shrimp the region is known for. More relaxed than other destinations, Guaymas has a less touristy feel and is popular with retirees. Sights including San Fernando Church built in 1850 and Thirteen of July Square, designed by Gustave Eiffel, best known for the Eiffel Tower in Paris. Only 718 miles from San Diego, Loreto is a unique coastal town on the Sea of Cortez close to the southern tip of the Baja Peninsula with fantastic views of the Gulf of California. 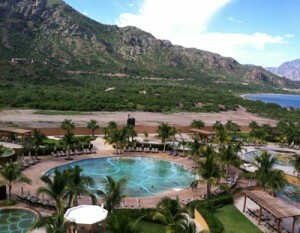 Known for the Bahía de Loreto where visitors can spot abundant sea life that includes pelicans, whales and dolphins. Loreto is bordered by the Sierra de la Giganta mountain range where adventurous travelers can follow trails to prehistoric cave paintings. Situated to the southeast of Mexico City, Puebla is 770 miles to the south of Laredo, and has an eclectic mix of offerings for visitors. At first glance you’ll notice an abundance of churches. Locals say there are 365 – one for every day of the year. Puebla has a rich culinary history, claiming to be the origin of mole (a sauce made of chili peppers, chocolate, cinnamon, cumin and other ingredients), so it is a popular dish there. Shredded beef Pelonas are also a popular meal. The painted Talerva tiles that give Puebla its unique look are locally made. Uriarte located downtown is the best place to shop for them. As the origin of the Cinco de Mayo tradition and a UNESCO World Heritage sight, Puebla is a historically rich destination. A road trip from the US to Mexico can be an exciting and fulfilling experience provided you plan ahead and keep a few basics in mind. Always plan for fuel stops. It’s easy enough to pinpoint cities along the way with petrol stations and manage fuel consumption. And, never drive at night. When possible use toll roads, which are better maintained and easier to navigate. Acquiring travel insurance can help mitigate unforeseen circumstances. As well, Mexico liability insurance is a requirement. Whether going for a day trip or making a once-in-a-lifetime road trip, Mexico has a lot to offer. Four separate coastlines, a vast and mountainous center region, and other hidden gems offer a rich history, culinary delights, and a lot of friendly faces. Get multiple quotes in 2 minutes! Are you Insured in Mexico?